Noel Hogan reflected on his pre-stardom years as a musician and meeting Dolores at the Xeric studios on his “Smart Arts” series interview. 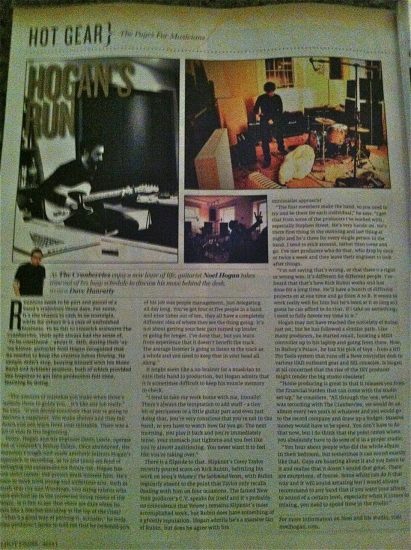 “Lots of songs from the first album were just instrumentals for months and months [before we met Dolores]” explained Hogan. Hogan spoke about the first album’s slow start and empty venues in the UK until “Linger” became a hit in the USA. Noel finished up the interview talking about his work as a producer and The Cranberries reunion. Noel Hogan is featured in a one-page article entitled “Hogan’s Run” in the latest issue of the Irish magazine Hot Press. Here’s a picture of the article provided by Noel himself on his public Facebook page. If anyone has a clearer scan don’t hesitate to share it with us. Noel Hogan’s interview on SPIN South West Radio has moved. Tune in on SPIN web radio player at 2:15 pm to 2:35 pm (Ireland time zone) Friday, July 27th. SPIN South West sets out to prove that the South West contains some of Ireland’s most creative individuals, with a new arts/culture series “Smart Arts” that starts this coming Friday, June 29th. Over five consecutive Fridays, everything from knitwear design to literature to film-making and design to rock and pop stardom will all be covered in this profiling series. The Cranberries and guitarist Noel Hogan speaks to SPIN on July 27th. Ever wonder who was beyond the album cover for DJ Shadow’s seminal hip-hop record Entroducing? None other than Limerick’s Brian Cross, aka B+, who has spent the past two decades in LA, writing, filming, photographing, and djing, and is featured on the July 20th edition of “Smart Arts”.